Being the wise betches that we are, readers/betchy followers often write into us to us for advice on their sad handwritten book lives. 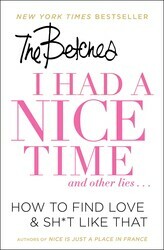 Here we’ve shared one of the Dear Betches letters that was lucky enough to make it into our new book, I HAD A NICE TIME AND OTHER LIES…: How to Find Love and Sh*t Like That. We’re like Dear Abby, but without the 80s hair. PLOT TWIST!!!!!!!!!!!!!! I heard a huge screeching halt sound in my head. What in the actual f**k? As I’m sure you can imagine, it totally killed our vibe, and we couldn’t really look each other in the eye after that. Anyway here is my question. He added me on Facebook and we have been chatting here and there. Definitely holding back, but still sort of flirting. Is it nasty that I still want to hook up with him despite the fact that we basically share the same blood? Because like, there’s your cousins . . . and then there’s your first cousins . . . wait that’s not right, is it . . . ? HELP ME. HE’S SO HOT. WHAT DO I DO?!? I’m going to ignore your annoying il est adorable statement and just chalk it up to you being slightly nuts, which you’d have to be if you’re really considering pursuing a relationship with your cousin. Now, it’s not even like you’re in the territory of fourth or fifth cousins where you have no idea how you’re even related, second cousins are very simple to understand. They’re the children of your parents’ cousins. It’s f***ing creepy. 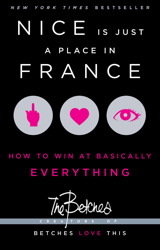 Plus, this guy lives in Paris. Are you telling me that the dating pool where you live is so small that you’re actually considering entering a long distance relationship with a person with whom you would probably wind up producing special needs children? What are you going to tell your kids? That mommy and daddy have the same great-grandparents because, well, blah blah blah Habsburg princes did it blah blah? No. Just no. It’s fine to think your second cousin is hot, but just stay away from that sh*t. Aside from the creepy aspect of sharing the same bloodline, do you want to get into something with someone who’s going to be at every family function for the rest of your life after you inevitably stop hooking up/hanging out/discussing the fact that you share the same ancestry? This isn’t f***ing Game of Thrones. If you’re looking to meet guys, take up a new hobby or hit the bars, not your goddamn family reunion. Want more betchy advice? Check out our new book, I HAD A NICE TIME AND OTHER LIES…: How to Find Love and Sh*t Like That, available now in hardcover and e-book from Gallery Books!